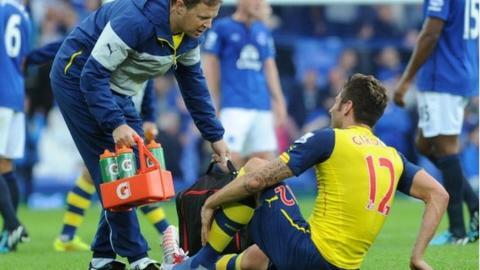 Arsenal striker Olivier Giroud will be out until the end of December after having surgery on a broken leg. The club received the results of a second scan on Wednesday, which confirmed the France international had broken his left tibia. The 27-year-old suffered the injury in Saturday's 2-2 draw at Everton and has been ruled out for up to four months. "You'll ask who we'll buy to replace Giroud. At the moment, nobody," Gunners manager Arsene Wenger said. "Giroud had surgery for a broken tibia and he will be out for three to four months on the competitive side. "He'll be capable to play again in the Premier League at the end of December." Arsenal beat Besiktas 1-0 on Wednesday to reach the Champions League group phase for the 17th successive season. Alexis Sanchez, a summer signing from Barcelona, has primarily been used in wider areas since his arrival, and scored his first goal for the club against the Turkish side. Joel Campbell, Yaya Sanogo and Lukas Podolski can also play in attack for the Gunners. Giroud joined from Montpellier in 2012 and started 36 of Arsenal's 38 Premier League matches last season, scoring 16 goals. He came off the bench to score a 90th-minute equaliser at Goodison Park but picked up the injury in the closing seconds of Saturday's game. Arsenal are already without forward Theo Walcott, who is also recovering from a long-term injury and Mikel Arteta, who has an ankle problem. The transfer window closes on 1 September.